Cams Hill School has a vibrant musical life and pupils are supported to develop into confident performers and composers through excellent music learning experiences. Our dynamic Music Department teaches instrumental music, singing and music theory lessons to over 170 pupils and runs a huge range of ensemble groups, from the Soul Band to the Classical Chamber Orchestra, as well as offering pupils the opportunity to shine in our popular musical events, from the Christmas Concert to the Jazz Café. Music lessons have also been proven to help develop higher order thinking skills that are essential across the curriculum and listening skills that are essential in life. 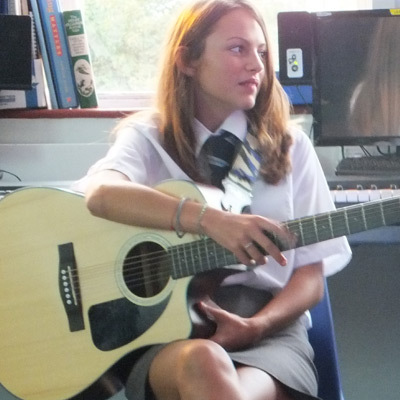 We encourage any pupil who is interested in the possibility of beginning or continuing to learn a musical instrument or singing to take up the opportunity of lessons at Cams Hill School. Instrumental and singing lessons are 30 minutes long and take place in school time on a strict rotation so that pupils do not miss the same lesson on too many occasions. Pupils can expect to share the lesson with up to three pupils, although the majority of the time lessons are delivered to individuals or pairs. Pupils who are learning singing or an instrument are expected to take part in after-school or lunch-time extra-curricular activities where further instruction is given. The cost of these lessons is currently £85 per term*. If you would like your child to have instrumental lessons when they start at Cams Hill School in September, please contact Mr Sedgwick or Miss Criglington via office@camshill.com. * No pupil will be disadvantaged through financial hardship. Please contact us via office@camshill.com.